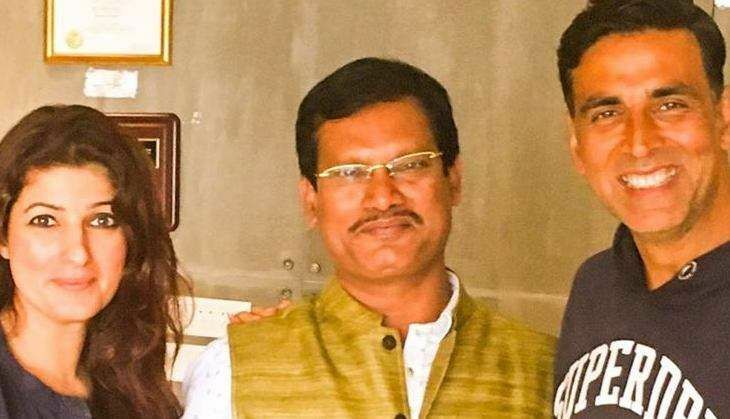 It's widely known that Bollywood actor Akshay Kumar and his wife, actress-turned-writer Twinkle Khanna are teaming up for a film based on the life of Arunachalam Murugunathan, a social entrepreneur from Coimbatore, Tamil Nadu. The film, titled Padman, also marks Twinkle Khanna's maiden film production banner, Mrs Funnybones. Recently, ​Arunachalam met Akshay Kumar and Twinkle Khanna at their residence in Mumbai. Reportedly, the 2016 Padma Shri award winner was sharing his experience to the star couple for the film based on his life. He also took to his Facebook profile to share the photographs as well. Arunachalam Murugunathan is the inventor of a low-cost sanitary pad making machine and has innovated grass-roots mechanisms for generating awareness about traditional unhygienic practices around menstruation in rural India. His mini-machines, which can manufacture sanitary pads for less than a third of the cost of commercial pads, have been installed in 23 of the 29 states of India. He is currently planning to expand the production of these machines to 106 nations. Directed by R Balki, Padman stars Radhika Apte and Sonam Kapoor along with Akshay Kumar. READ NEXT >> Taher Shah has a Valentine's Day gift for his angelic fans ! !